When you call a book World Boom Ahead, you make it abundantly clear that you're not expecting to see the Four Horsemen of the Apocalypse riding into Washington or Tokyo anytime soon. 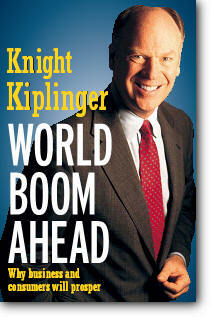 How good does Kiplinger expect things to get? He sees two more decades of 1990s-like growth for the U.S. economy, with continued low inflation and increasing productivity. He sees the rest of the world starting to catch up to the economic prowess of the wealthy West, with the biggest developing nations–India, China, Russia, Brazil, Indonesia–doubling their share of world GDP, to about 16 percent. Still, Kiplinger, editor in chief of Kiplinger's Personal Finance magazine, manages to keep his optimism bridled. Wherever there's a dictatorship or corrupt government, economic prosperity will be put on hold. And, of course, regional wars will still flare up. In other words, Kiplinger sees a world a lot like this one, only more prosperous globally. But even if the predictions in World Boom Ahead aren't particularly startling, the analyses backing them up are worth the time it takes to read and digest them. For example, in a section on why U.S. savings rates are low relative to other nations', Kiplinger notes that savings tend to decline when people feel confident about their economic future. In another section, he shows that taxes have remained about 20 percent of the U.S. GDP since the end of World War II, contrary to the idea that there has been an ever-increasing tax burden in the late 20th century. Part celebration of the achievements that put us in such prosperous times, part analysis of why those good times should continue, and part economics lesson, World Boom Ahead is a consistently fascinating look at our fiscal present and future.